This kasha used to make our grandmothers and it's still prepared, especially in our Macedonian villages. I must admit that this recipe wasn't known to me, until someone asked for it in inbox. In consultation with my 70year old mother in law, she told me the recipe and confirmed that this kasha recipe was very popular in the past. 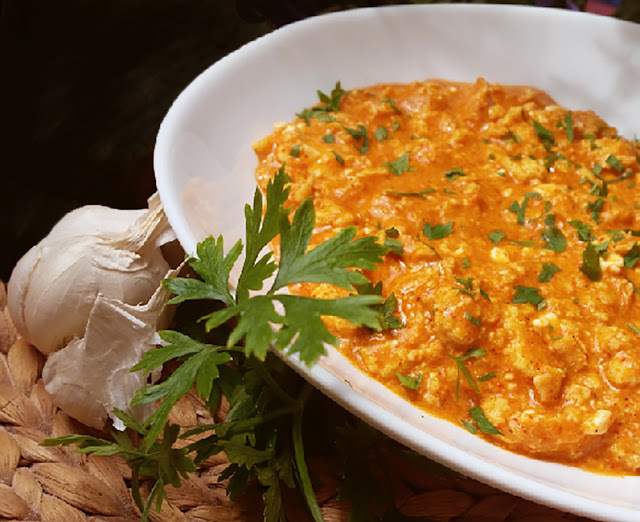 So if you want a real Macedonian cuisine touch in your kitchen - try this kasha recipe. You can share your experience in inbox or under this recipe on fb. First finely chop several cloves of garlic, the peppers too and fry together until garlic becomes well fried. Add the ricotta, continue the frying. If the ricotta is not salty, add a little salt. Make a little space in the pan and pour oil in that space and fry the flour there, then mix everything. Gradually and slowly pour hot water and mix constantly, and water is applied as long as there is a need to obtain pulp of desired density. The rest of the garlic is cut into small slices and mixed in the kasha and left to boil for another 10-15 minutes. If necessary, add some more salt. If you aren't very fond of garlic, then don't add it now. Serve warm, sprinkle chopped parsley and Bukovska pepper.